In a world that has become exponentially reliant on technology, learning to code is the difference between learning to read and learning to write. It has moved from being a marginal skill to a powerful enabler of innovation and creativity. From making games, to fighting cybercrime, to designing a jet propulsion engine, computing is essential knowledge. Digital making covers all forms of creating using digital technology, from learning and writing code to making and mixing a music video online. Teaching these skills to children will help them to become creators, not just consumers, of digital technology – equipping them with the skills to become problem-solvers and digital-makers for jobs that don’t yet exist. In November 2012, No. 10 commissioned a new project of the Partnerships Team; to scope the potential for government to run a summer campaign to promote coding and computer science skills for young people. Ultimately, this led to government involvement in the ‘Make Things Do Stuff' Campaign – which gave over 150,000 young people the opportunity get involved in digital making. The Partnerships Team in the Cabinet Office was established in 2011 to improve the strategic collaboration of Cabinet Office and No. 10 with big business, in order to deliver innovative solutions to priority policy challenges. Since 2011, it has developed strong relationships with over 80 leading employers across four sectors covering: retail; food and drink; manufacturing, infrastructure and energy; financial and professional services; and tech, telecoms and media. It acts as a trusted point of contact between Ministers, Special Advisers and Senior Government Officials and Senior Executives in business. These relationships are used to provide business intelligence and advice to Number 10, the Prime Minister (PM), Deputy Prime Minister (DPM) and Cabinet Office, and to drive PM and DPM policy initiatives. by businesses and social enterprises. However, no single organisation was delivering a solution at scale. One initiative emerged as an ideal opportunity to achieve the goals of the original commission: Make Things Do Stuff (MTDS), which focussed on digital making of all kinds, and was being developed by Mozilla, Nesta and the Nominet Trust. So rather than create a competing Government led initiative, Partnerships Team agreed with No 10 that it would focus its efforts in supporting MTDS. Government’s engagement in the project introduced an element of accountability and a greater expectation of outcome, raising the ambitions of the ground game delivery organisations. Critically, it provided backing and support that helped establish partnerships with big businesses that would otherwise have taken far longer to secure, if at all. Government is many things but it is not a coding organisation, a global browser company or a manager of funds it doesn’t own. Connecting with delivery partners meant that work was taken forward by those expert at it. There were four key parties to the policy delivery: Nesta, Nominet Trust, Mozilla and Cabinet Office. Individual organisations, with support from others, delivered the various elements of the project: managing the Digital Makers Fund, brokering partnerships, running the website, compiling and monitoring the statistics, external communications. Actual delivery of the digital making opportunities came from the ground through game operators such as CodeClub, Young Rewired State, Apps 4 Good, and Freeformers. What the Cabinet Office could provide, however, was the co- ordination of cross government engagement, the backing of Cabinet-level ministerial support and the convening power of Government. The Partnerships Team secured the backing of the Chancellor as campaign champion. This indicated buy-in at the very highest level of government and enabled the team to obtain additional support and resources from big business. In addition to those already engaged, the team brought in existing initiatives (eg Microsoft and the Kodu Cup) and secured new partnerships and in- kind support from related initiatives, such as the National Citizen Service and plotr. In three set piece events over ‘The Summer of Making’, MTDS was tied to key Government messages on open data, transparency, the digital economy, curriculum changes. The events (a launch at the Roundhouse with the Chancellor and young digital makers; a G8 Tax, Trade and Transparency event at Lancaster House with Francis Maude and; a five-day presence at Campus Party at the O2, involving a panel discussion between the Chancellor and Jimmy Wales) also brought coverage in national press and digital media. This generated more interest in the MTDS activities and encouraged other brands to get involved. By linking MTDS to other related government policies and a cross-government coordination roll (growth of the digital economy, Tech City, computer science curriculum, National Citizen Service), the team ensured a coherent approach from Government, and demonstrated that industry involvement in these initiatives were not isolated interventions. By September, the original target of reaching approximately 100,000 young people through a range of opportunities had been surpassed. The best way to think about MTDS and its journey is by thinking of a start-up business. The Partnerships Team relied on small contributions from several individuals and organisations to help get it off the ground. However, as the campaign grew, the message changed, audiences shifted and requirements of partners competed. This brought some practical challenges. The number of organisations involved in the project resulted in some competing objectives. For Government, the campaign’s aim was to deliver the Government message at scale and bring big business in to support the delivery of the commitments. For Nesta, Mozilla and Nominet Trust, it was also about testing approaches and outcomes for young people, supporting digital making organisations to grow and proving concepts. The role of the Partnerships Team was to keep the campaign united and on track. Being visible and contactable, often by getting out of the office, was key and regular phone calls followed an intensive period of face-to-face meetings. Variable success in using technology to collaborate (for example, through etherpads and google docs), highlighted the need for the Civil Service to keep apace with technological opportunities. At the time our IT systems were not set up to work in the open, collaborative, multi- agency way. Government’s commitment to delivering 100,000 digital making opportunities to young people by September needed to be met and evidenced. But the broad range of partners delivering those opportunities in many different ways made it difficult to get accurate and timely data on progress. There needed to be greater clarity about goals, targets, accounting and whose responsibility it was to collect this data from the outset. Whilst there was a dedicated press officer at Nesta, initially, the project lacked the support of a dedicated communications lead within Government. The number of different organisations sometimes muddied the clarity of the campaign’s message. Was it about inspiring a generation of digital makers, was it only about coding or was it about innovation in the way digital skills could be delivered? This lack of clarity on an agreed central message made it difficult to seize opportunities to promote new commitments or encourage further commitments from the private sector. By the time O2/Telefonica’s Campus Party arrived in September, however, the Cabinet Office and Treasury communications and press teams had been engaged, and the Latimer Group had engaged a team of young, tech savvy talent to create new content, particularly for the website. This central, strategic comms team needed to be there from the beginning, however. Nevertheless, whilst the large number of partners, and the lack of a “fixed” message from the outset brought challenges, it was one of the drivers of the programme’s overall success. Had its scope been too narrowly defined, the programme would almost certainly not have achieved what it did. Clearly, there is a need for a careful balance between keeping opportunities open, without overly muddying the clarity of a message. 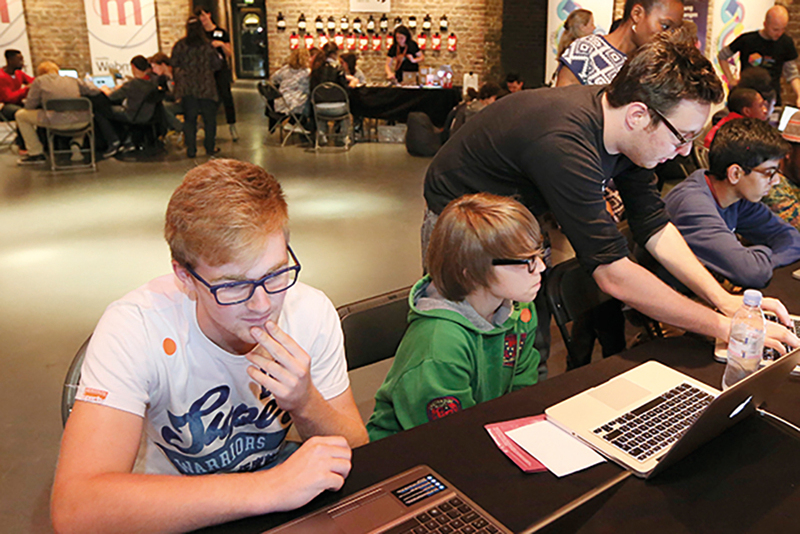 "Samsung was glad to have the opportunity to be involved in the Make Things do Stuff Campaign, which brings together organisations working hard to bridge the technology skills gap for young people in the UK. Bringing these together on one platform has helped begin the process of providing consistency and scale. It's important that this continues and maintains momentum." The legacy of the Make Things Do Stuff Campaign is evident with a continuing focus on digital making being seen across the country. The partnerships developed around the campaign have continued to flourish, taking on new directions and involving more and more people. The BBC have now launched their Make It Digital season which develops the partnerships created through MTDS and delivers at a true scale. In conclusion, delivering the project through a collaborative partnership, and adding value to an existing campaign rather than duplicating efforts had significant benefits. It was an effective use of resource and enabled the individual organisations to focus their efforts where they were most effective, whilst boosting the overall impact of the collective efforts. Do your homework and target relevant companies – are they doing anything relevant you can build on?